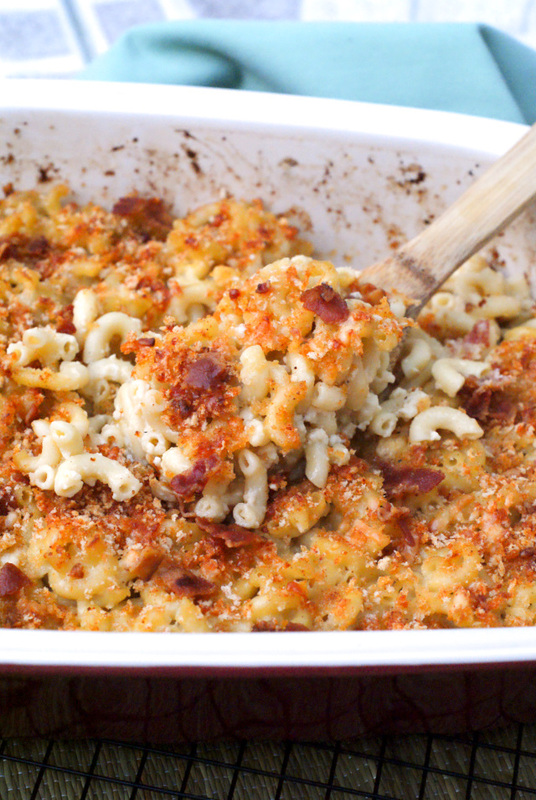 This Baked White Cheddar Bacon Mac and Cheese is a southern-style macaroni and cheese that is thick, rich, full of white cheddar cheese and bacon. and topped with a golden, cheesy, buttery breadcrumb crust. It's no secret that macaroni and cheese is my favorite food, specifically baked macaroni and cheese made with super sharp white cheddar cheese. My mom's recipe is our "family" recipe and I love it forever. While my Mom's recipe is def the best, sometimes it's nice to switch it up, just for the sake of variety, you know? I actually have three mac and cheese recipes on the blog (so far!) and I don't doubt I'll continue coming up with new variations to share. This time, I decided that I wanted to try a baked macaroni and cheese with bacon, because, well, doesn't bacon mac and cheese sound just divine?! Bacon is one of those foods that can make any meal better in my opinion! For the cheese, you could easily use an orange cheddar or even a mixture of any other cheeses that strike your fancy, but I decided to stick with my fave white cheddar that we use in my family recipe. I went the southern-style route this time around, which is a little more custardy than creamy, made with beaten eggs mixed into the mac. Sounds odd, I know, but it all comes together in the end, I promise! The finished casserole comes out of the oven with a beautiful, buttery, golden breadcrumb topping which may not be 100% southern, but it totally 100% irresistible. 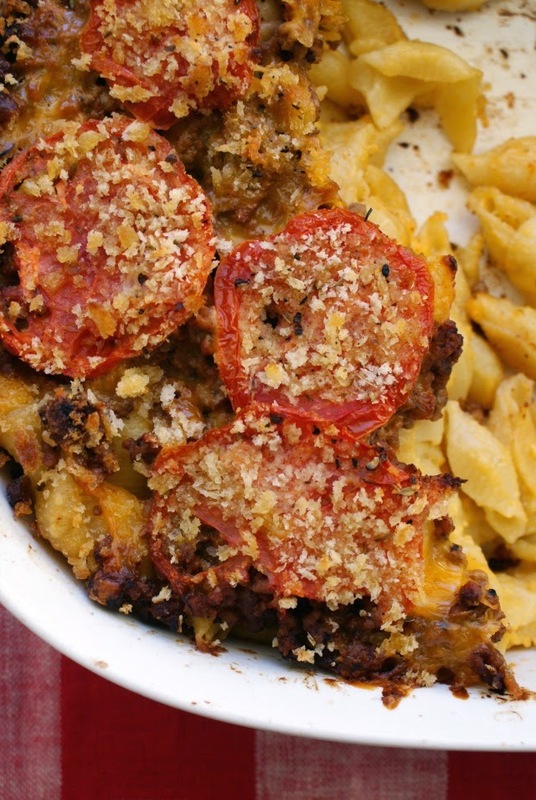 That breadcrumb topping is the stuff dreams are made of! I sound a bit melodramatic, I know, but mac and cheese is my spirit animal, so I can't help my enthusiasm. Ha! This recipe makes a nice big pan, which is ideal if you're feeding a crowd or if you are fond of eating mac and cheese for breakfast, lunch, and dinner as leftovers like I do. Not sure if this is the mac and cheese recipe for you? 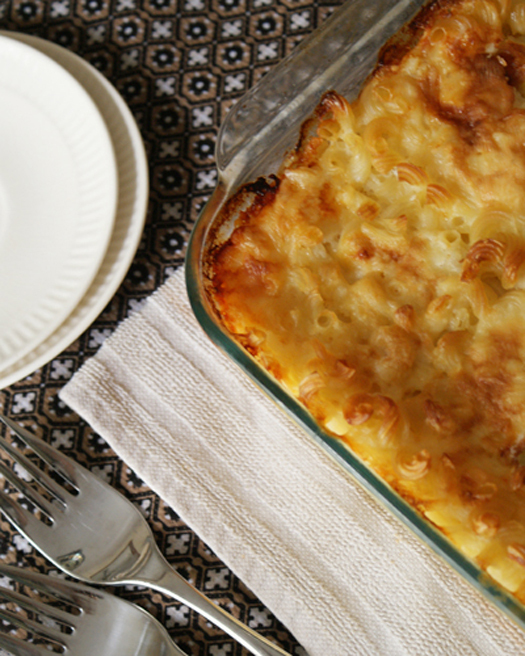 Check out my other macaroni and cheese recipes from the archives! Which one looks like the one that would be your fave? I'd love to know in the comments below! Preheat your oven to 350 degrees. Grease a 9x13-inch glass baking dish with 2 Tbsps butter. Cook the macaroni until al dente, drain, and transfer to the baking dish. In a saucepan, melt 2 Tbsps of butter with the bacon grease. Whisk in the flour. Slowly add the milk, whisking constantly and simmer until thickened. Stir in the shredded cheese into the sauce a little bit at a time, reserving 1/2 cup for the topping. Season with the pepper, nutmeg, and ground mustard and continue cooking until the cheese has completely melted. Stir in the crumbled bacon, reserving 1 Tbsp for topping. Stir the eggs into the elbow macaroni. Pour the cheese sauce over the macaroni and stir to combine. In a small bowl combine the reserved shredded cheese, reserved bacon, panko breadcrumbs, and smoked paprika. Sprinkle evenly over the top of the macaroni. Cut the last Tbsp of butter into small pieces to top the casserole. Bake for 40-45 minutes or until the top is golden. Let sit 10 minutes before serving.